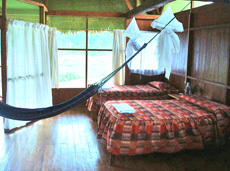 At the confluence of the Tambopata and Madre de Dios Rivers and only half-an-hour flight from Cusco, Puerto Maldonado is a small village, point of departure for jungle lodge adventures. Day 1: Welcome in Puerto Maldonado. Visit the Inkaterra Butterfly House near the airport, check-in, and in only 15 minutes, you can get to the boarding wharf. Begin to experience the enchantment of the rainforest, as you take a 45-minute boat ride along the Madre de Dios River to arrive at Inkaterra Reserva Amazonica lodge. After a short briefing, settle into your beautiful cabaña and enjoy your lunch in the dining room. 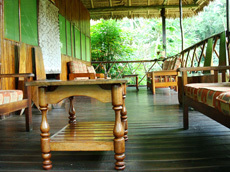 Take a siesta, share a refreshing tea time and get ready for the afternoon excursion. After gathering with your inkaterra Interpreter, choose from the 14 different excursions available at the Inkaterra lodge. On your first day, we recommend a guided walk along the Trail system, into the Inkaterra Reserva Amazonica natural area, where you will discover the Amazon Basin. 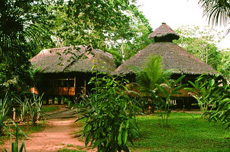 This trail offers an excellent introduction to the forest environment, winding past impressive trees such as the staggeringly tall kapok, and the strangely beautiful strangler fig, offering excellent opportunities for bird watching and observing exotic insects. We also recommend on the first night our Twilight River excursion — a guided afternoon boat ride downriver from the Inkaterra lodge. 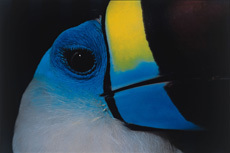 Witness the transformation from a diurnal to a nocturnal world: animals and birds of the daytime give way to species specially adapted to the night. 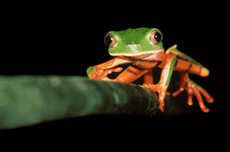 As you enjoy their paradise, you will learn about their habits, while you search for nightjars, owls, capybaras and big caiman. Day 2: Rest in bed or rise early — the choice is yours. Breakfast begins at 5:30 a.m., for those who want to avoid the heat and enjoy nature at its fullest. A full buffet breakfast is served from 7 a.m. to 9:30 a.m. 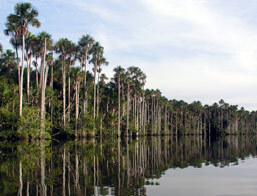 This morning you may visit the Sandoval lake excursion into the Tambopata National Reserve. Glide in a wooden canoe, across a beautiful, mirror-like oxbow lake that is home to the endangered giant river otter, as well as red howler monkeys, red-bellied macaws, anacondas, point-tailed palm creepers and side-neck turtles. 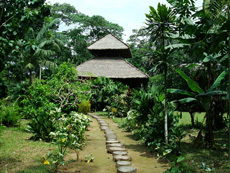 Return to the Inkaterra lodge for lunch. 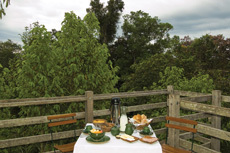 After lunch, consider visit the remarkable Inkaterra Canopy. Ascending the first tower, 29 meters above the forest ground, you begin your encounter with the treetop realm. For more than a quarter of a mile, you will literally walk through the rainforest canopy on a suspension bridge network linking eight observation platforms. Day 3:Enjoy a full breakfast before departure. A 45-minute return trip by boat on the Madre de Dios River takes you to Puerto Maldonado to take the flight to Cusco or Lima. Day 1: Puerto Maldonado to Lake Sandoval. Our staff welcomes you at Puerto Maldonado airport and we drive through this bustling Upper Amazon Basin city to the Tambopata River boat dock. Here we board a powerful motorized dugout canoe and set off to the nearby confluence of the mighty Madre de Dios River, a headwaters tributary of the Amazon. Here we turn downstream for a 25-minute river trip to the trailhead landing at Lake Sandoval. Stopping as we go to spot birds and butterflies, we walk – or take a rickshaw ride – along the 3km/2 mile trail to the narrow boat channel through flooded palm forest that leads to the open waters of this peaceful lake. As our crew paddle us across to the lodge (motors are prohibited here), we may see the lake’s surface boken by a massive Paiche – an Amazon fish that can reach 100kg/220lbs. Or perhaps we will hear the strange and haunting calls, and see the heads bobbing above the lake’s surface, that will signal our first acquaintance with Pteronura brasiliensis, the Amazonian Giant Otter. After lunch and a brief rest to avoid the early afternoon heat, we once again set off by boat or catamaran to explore the entire west end of the lake. 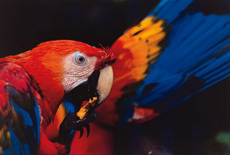 Here, along the fringes of flooded palm forest we drift to the sounds of hundreds of Red-Bellied and Blue-and-yellow Macaws as they return to the palm forest for the night. Our viewpoint from the canoe often allows closer and more extended encounters with birds and mammals than on a typical forest trail hike, and we may witness intimate feeding and mating behavior. On Lake Sandoval monkeys, in particular, have almost lost their fear of humans. A pre-dawn wake-up call will allow us to be on the lake for what is often a spectacular sunrise, and hopefully an encounter with the Giant Otters, which patrol the entire lake in a close-knit family pack, and are most active at this hour of the day. Most of the lake’s birdlife is extremely active now, too, and this outing should provide views of numerous species of fish-eating birds as they stalk and catch their prey, along with close-up views of the large, clumsy and primitive leaf-eating Hoatzins. After returning for a late breakfast we set off on a trail walk through the cool understory of the mighty primary rainforest that surrounds the lake. We will see the great Brazil-nut trees that are abundant here, and meet a local family – the only people permitted to live here permanently and harvest the natural bounty of Lake Sandoval. They will show us how they collect the nuts, remove their shells and market this important forest product. After dinner we will have another chance to spot caiman on the lake, or perhaps take a night trail walk in search of the numerous creatures, including frogs, toads, owls, nighthawks, spiders and night monkeys, that make the forest such a busy and different place during the night. Day 3: Lake Sandoval to Puerto Maldonado. Day 1: Flight to Puerto Maldonado, and journey to the lodge. Transfers from the airport to the port in Puerto Maldonado and viceversa. Accommodations with all meals (from lunch on the first day to the breakfast on the last day). 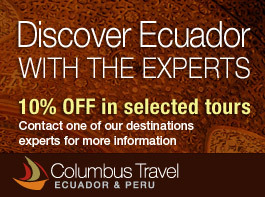 All guided excursion describes in each itinerary. Tambopata National Reserve entrance fee at Reserva Amazonica and Sandoval Lake Lodge.